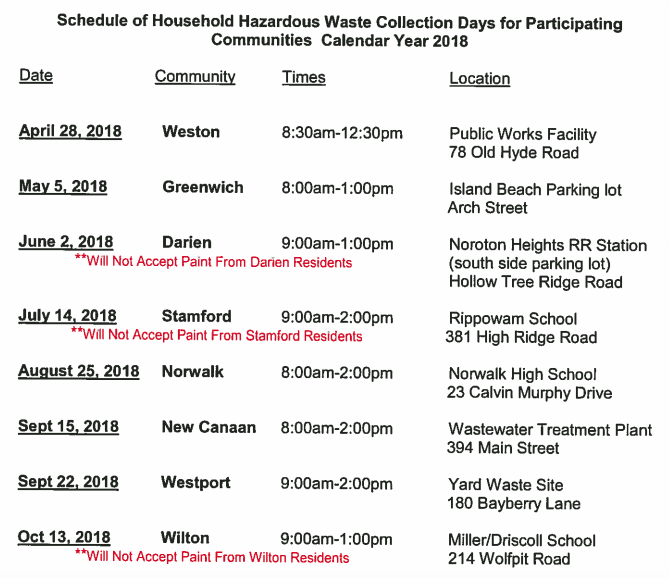 Darien residents can bring household hazardous waste to various collection events held in southwest Fairfield County starting Saturday, April 28 in Weston and continuing about once a month through October. The next weekend, on May 5, there will be another one in Greenwich (see schedule below). Darien’s own Household Hazardous Waste Day is on June 2 and takes place on the south side of the Noroton Heights Railroad Station (the side closest to Interstate 95) where area residents will need to use the Hollow Tree Ridge Road entrance. Darien residents can recycle paint by dropping it off at the Recycling Center — also known as the Dump or the town Transfer Station — so no paint is accepted for Darienites at the Darien household hazardous waste collection. But if you don’t have a dump sticker, you can still go to a household hazardous waste collection event in a nearby town. Here’s a long list of rules on the town government website, including what kinds of waste are accepted and what not to bring to the event. Darien’s collection day and Weston’s are the two shortest events — four hours each. Last Saturday's Household Hazardous Waste Day dropoff event at the Noroton Heights Railroad Station parking lot had much lower participation and volume than in previous years — but apparently that's because paint is now collected regularly at the town transfer station/recycling center. This year, Darien will only pay $3,832.50 to a contractor that accepts the waste collected on Household Hazardous Waste Day. You can drop off household hazardous waste in Norwalk today, Saturday, Aug. 25, but only until 2 p.m. Norwalk's event, open to residents from Darien and other area towns, started at 8 a.m. at Norwalk High School: 23 Calvin Murphy Dr. (County St.), Norwalk.